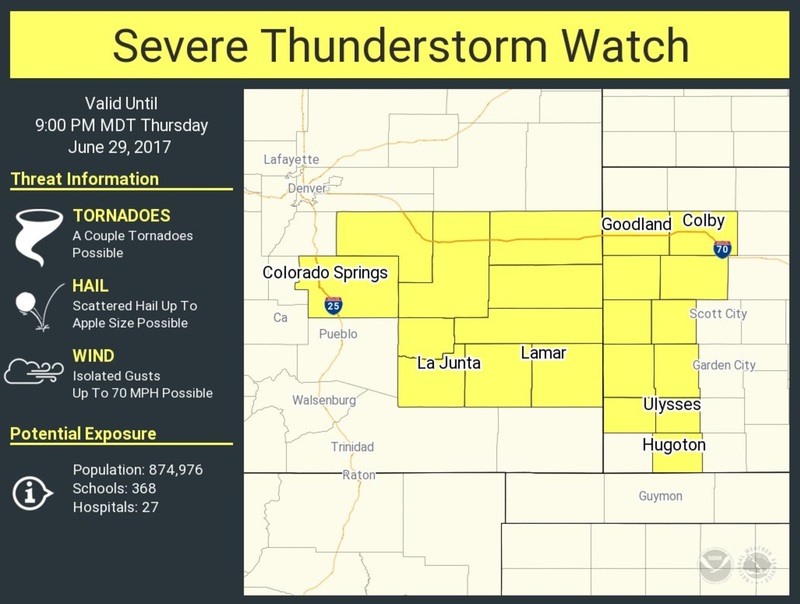 A Severe Thunderstorm Watch has been issued until 9:00pm MDT, this includes Colorado Springs and our UCCS campus. 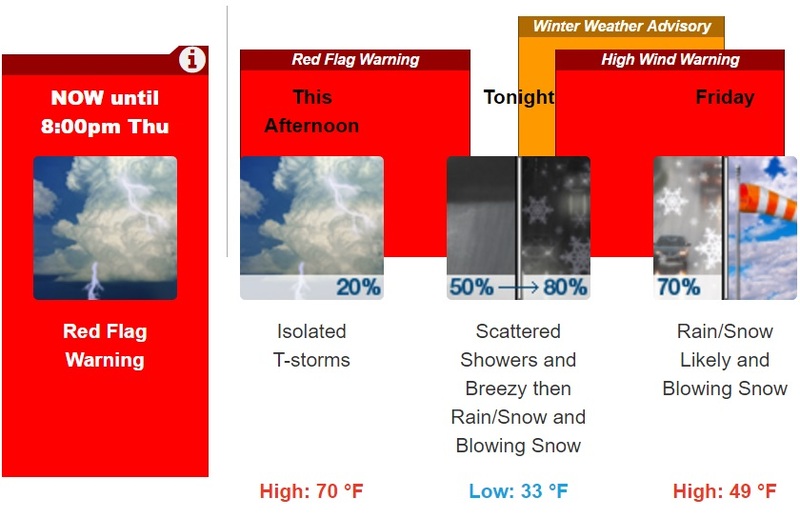 Stay alert to changing weather conditions, have a way to receive warning information, and be prepared to seek shelter indoors should storms threaten your area. This entry was posted in Uncategorized on June 29, 2017 by tstoeckl. 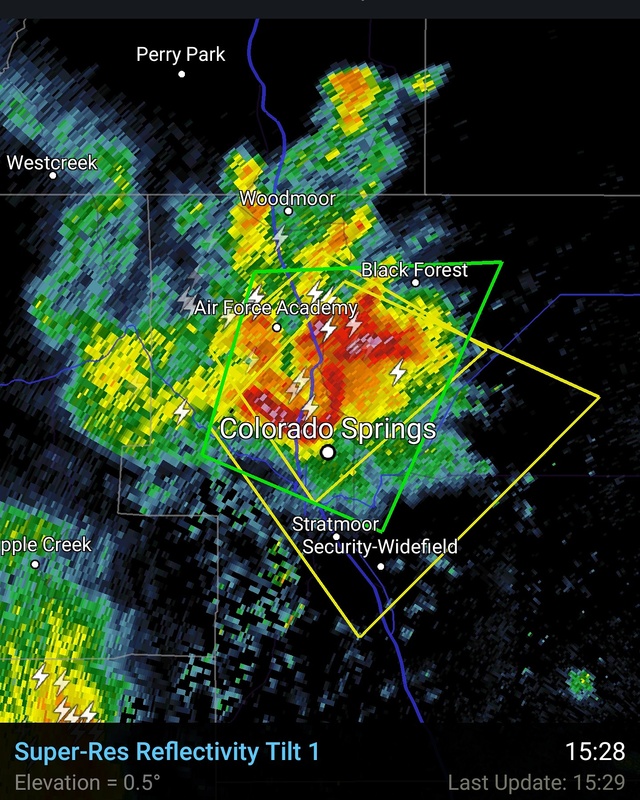 A Flash Flood Warning (green outline) has been issued until 6:30pm, includes our UCCS campus. This entry was posted in Uncategorized on June 6, 2017 by tstoeckl. 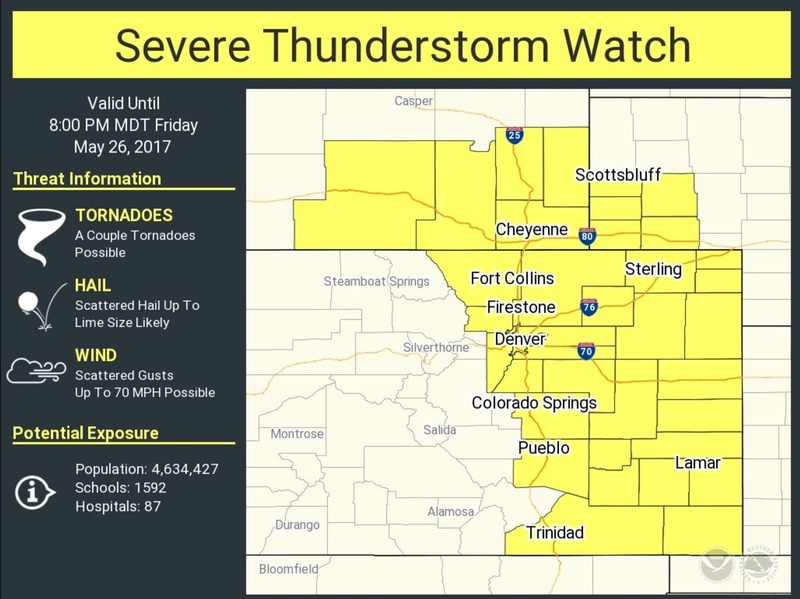 A Severe Thunderstorm Watch has been issued until 8:00pm. Large hail to 2″ and damaging winds are the primary threats for our area. Stay weather aware, and be prepared to seek shelter indoors should a storm threaten your area. This entry was posted in Uncategorized on May 26, 2017 by tstoeckl. For Tuesday, April 4, 2017, UCCS is CLOSED due to inclement weather. All office hours, classes & activities are cancelled. This entry was posted in Uncategorized on April 4, 2017 by tstoeckl. UCCS is on a delayed start for Tuesday, April 4, 2017. All office hours, classes, and activities prior to 12:00pm are cancelled. In compliance with the “Timely Warning” provisions of the Federal Jeanne Clery Act Disclosure of Campus Security Policy and Campus Crime Statistics Act of 1998, the University of Colorado Colorado Springs Police Department is issuing a notice of alleged invasion of privacy (peeping Tom). UCCS Police Department is investigating a report of an incident that occurred at approximately 8:31 a.m. on March 28, 2017 involving an unknown male party who followed a female staff member into the first floor bathroom of the University Center building. The male party is alleged to have watched the individual use the restroom. – last seen wearing a black baseball cap with white lettering and gray sweatpants. REPORT SUSPICIOUS ACTIVITY: The University of Colorado Colorado Springs Police Department urges everyone to use caution when encountering individuals who are not personally known to them and to remain aware of their surroundings at all times. Please report any suspicious activity or suspicious persons to the University Police Department. If you have any information that might be helpful in this investigation contact the University Police Department at 719-255-3111, attention to Detective Corporal Martin Toetz, or in person at the Department of Public Safety located inside the Gateway Hall building. Please encourage anyone with information to assist us in keeping the campus safe. If anything suspicious occurs or you are the victim of a crime, immediately contact the University Police Department from any campus phone by dialing 9-1-1 or at 719-255-3111 from your cell phone. Be aware of the Blue Light emergency telephones in the parking lots and throughout the campus. Report all suspicious persons or incidents directly to the University Police Department. The University Police Department provides escorts to any of the parking lots and nearby side streets, upon request. This service operates during the hours of darkness. This entry was posted in Uncategorized on March 28, 2017 by tstoeckl. UCCS is on a delayed start for Friday, March 24, 2017. All office hours, classes, and activities prior to 12:00pm are cancelled. This entry was posted in Uncategorized on March 24, 2017 by tstoeckl. A High Wind Warning has been issued for 3:00am to 5:00pm on Friday, March 24, 2017. Winds are forecast 35-45mph, with gusts to 65mph possible across the area. 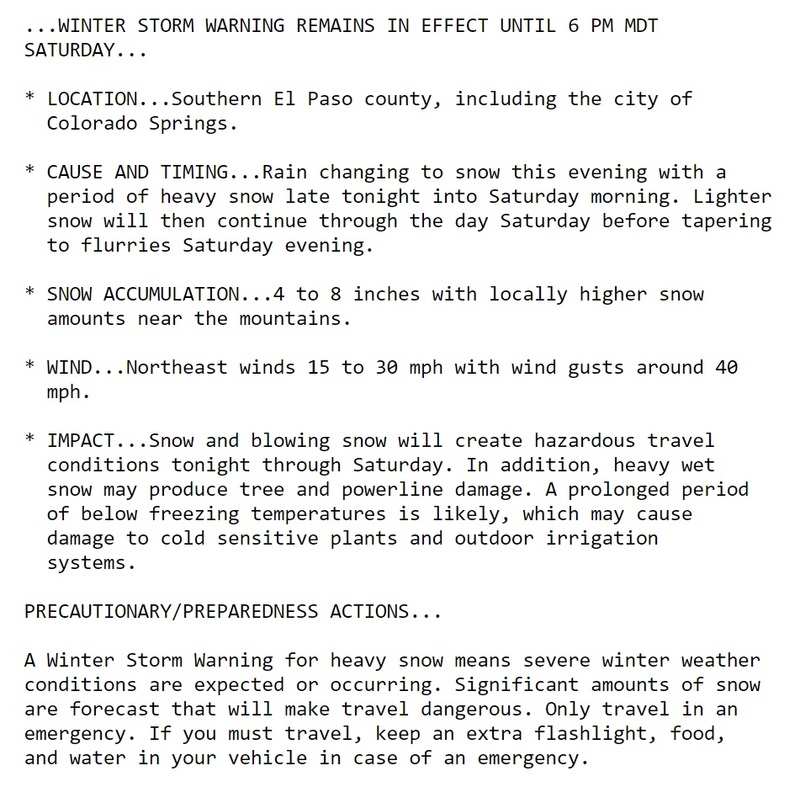 A Winter Weather Advisory has also been issued for southern El Paso county, including campus, 12:00am to 12:00pm on Friday, March 24, 2017. This entry was posted in Uncategorized on March 23, 2017 by tstoeckl. A Red Flag Warning has been issued for Thursday, March 23, 2017 from 11:00am – 8:00pm. 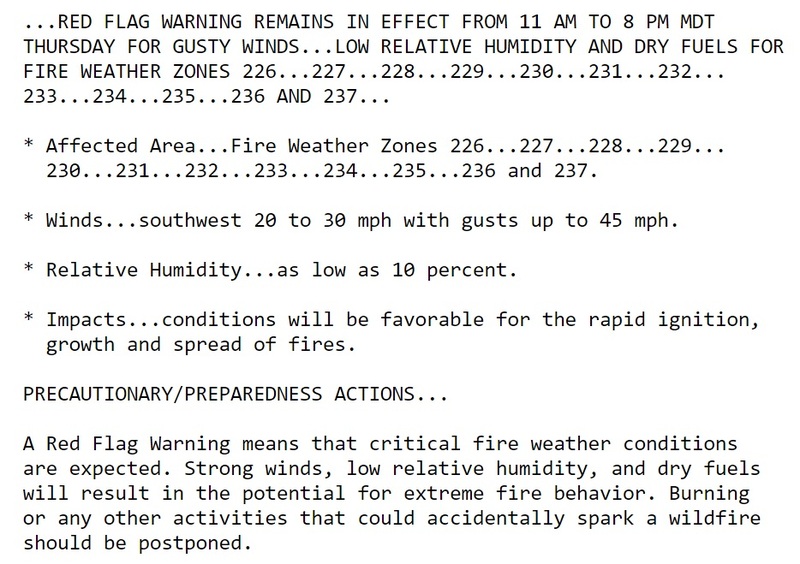 Strong winds, high temperatures, and low humidity will combine to create high fire danger. Avoid outdoor burning, use extreme caution with any ignition source, and dispose of all smoking materials in appropriate containers. This entry was posted in Uncategorized on March 22, 2017 by tstoeckl.